When it rains, it pours. For the last 15 years there have been rumblings surrounding the possibility of creating the impulse engine in “Star Trek”. 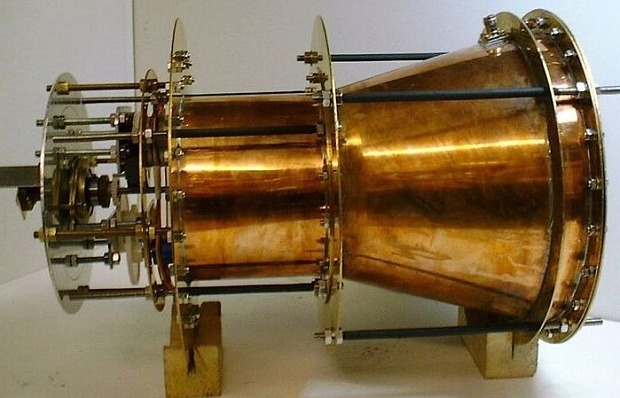 Nearly 15 years ago, British inventor Roger Shawyer proposed an EM drive that would produce thrust by using solar power to generate multiple microwaves that move back and forth within an enclosed chamber. Such a system would perpetually function until something failed or wore down. This meant that interplanetary and commercial supersonic flight within the Earth’s atmosphere would be possible without fossil fuel. Then there was the inventor of a magnetic engine that I reviewed in Japan. The whole reason oil prices had to rise was to inspire alternative energy sources. Once that developed, the race was off. The EM drive has shaken most scientists because it defies one of the fundamental concepts of physics — the conservation of momentum. In other words, this is much like markets and the concept that befuddles so many is that if a market rises, people become rich, but government does not actually create new money to reflect that value. Likewise, a market crashes and $1 trillion evaporates in value, but who wins when those who held share lose? The “money supply” when defined by asset values increases without anyone creating money because money is merely a unit of account and reflects what assets are worth when translated into money. It is not actually a zero-sum gain. What the EM drive demonstrates that the same principle exists and the idea of a zero-sum conservation of momentum is not true. The conservation of momentum states that for something to propel forward, something else must logically push in the opposite direction. In this concept, the forces inside the chamber should cancel each other out and the EM drive should not function when the same logic of markets is applied. So just because the Dow might drop 20% does not imply that someone else made 20%. The total reflection of assets translated into money alters. Indeed, NASA has confirmed that they believe the EM drive in fact works. Others testing the concept in Germany have also demonstrated that it produces thrust. With this degree of thrust, one could reach the Moon in four days. Further testing is underway as reported by the Telegraph. Nonetheless, we may be on the verge of the next technology wave that could in fact provide the next cycle of innovation after the economic decline.